Our massage services are designed to help you escape the everyday hustle and bustle, leaving you feeling relaxed and rejuvenated! Employing an array of Swedish techniques, this full-body treatment will loosen you up while targeting your most “troubled” muscles, improving circulation and reducing stress. This highly intensive massage therapy is intended for concentrated relief of stubborn areas of chronic tension, a must for men, athletes, and massage addicts everywhere. The perfect treatment for you expecting mothers, let a highly-trained massage therapist ease your lower back pain or any other area of discomfort. Maximize your time in the spa with our focused attention to whatever muscles are mistreating you most. The ultimate massage experience. 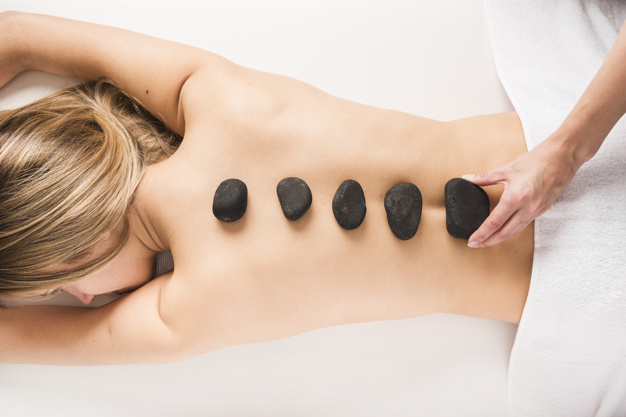 In this treatment we use warmed river rocks and a variety of Swedish techniques to target those painful problem areas. Your therapist massages your feet, applying pressure to the reflex points that correspond to glands, organs, and other parts of your body. You’ll be walking on air after this one! This ancient massage technique softens tight muscles, tones attachments, lifts connective tissue, improves blood flow, relieves deep inflammation, and drains excess fluids and toxins by opening lymphatic pathways. This light facial massage allows you to achieve a radiant glow, reduced wrinkles, clearer complexion, refined skin tone, cleared sinuses and diminished eye area puffiness. Twelve 50 minute monthly Moodz Massages, a wonderful year-round investment in your well-being.